When you have a new deck that needs to be finished or when you have an old deck that needs a makeover, the first thing you have to do is decide on whether to paint it or stain it. Few might prefer painting it to add a little color. Few might want to retain the natural finish and show off the wood’s natural textures. They might want to stain it. The key to attaining the perfect stained deck is to do it the right way. You could either choose to do it yourself or leave it to the experts. Choose the best experts in deck staining Tyler, TX to make your work easier and get the perfectly stained deck. Remember that the process would be a long one and requires a lot of meticulous steps to achieve the expected results. Why choose to stain your deck? Staining your deck can help retain the natural color and pattern of your wood. This would add to the rustic charm of your house. Staining your deck is a comparatively easier process than painting it. It is not as messy as painting. The preparation required is also pretty less. Staining is also a less time-consuming process. The wood preservative components in most stains do a great job in protecting the wood from rotting and molding. If done correctly, staining can be the best option for large exposed wooden surfaces. The main issue many people have with staining is that it doesn’t offer the durability one would get with a painted deck. Another problem is that staining doesn’t always offer the best possible protection against UV for the wood. So the wood might gray in few years. But both these issues can be rectified. By choosing the right stain and following the right process, you can definitely achieve a perfect stained deck that can be durable as well. Also, when it comes to UV blocking, solid stains or the stains that are nearly opaque can do a good job. So if your deck would receive a lot of exposure to direct sunlight you could choose a solid stain. Staining might be easier than painting. But take your time to achieve the perfect finish and longevity. Check the wood before you start, clean it and then apply the stain. Remember, when you stain a new deck, always allow the wood to weather a bit before you stain it. The new wood which has been pressure treated, has to be exposed and weathered a little for it to absorb and retain the stain better. First of all, choose the right time to stain your deck. Remember that the wood has to be perfectly dry. So do not start if you are expecting rain in the next few days. Also, avoid staining under direct sunlight. Ideally, for staining, the temperature has to be around 50ºF to 90ºF. Be it an old deck or a new one start with the superficial cleaning and removal of visible dust and debris. Clean out any grease and mildew on the surface. If there are splinters on your wood, sand it off. Stains don’t seep well into wood that is not clean. Once all the dirt has been swept off, apply a good cleaner on the surface and allow it do its work. After a few minutes, rinse the cleaner off with a high-pressure washer. 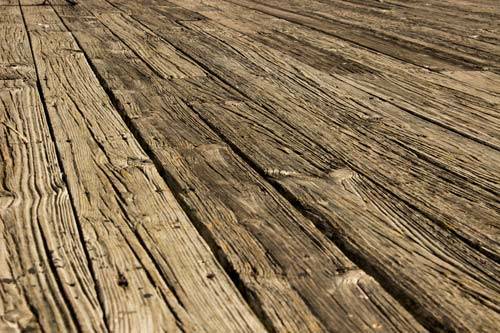 If it is an old deck that you are working on, there might be old stain residues. These should be removed before you stain it again. Use the right stain strippers. Stain stripper may be corrosive if not used cautiously. So be careful while applying it. Using a wood brightener is optional. The application process is easy. It helps open up the pores and neutralizes stain stripper residues. On application of wood brightener, the wood would absorb the new stain better. Dark stains or the nearly opaque ones are the best choice for UV blocking. Clear stains though are the best to expose and show off the original pattern, texture and color of the wood. Choose the right stain. Test on a small area to see how the result looks on your wood. Once you are done with cleaning and stain stripping, rigorously rinse off the wood and allow it to completely dry before you start the actual staining process. An easy way to check if the wood is ready to take the stain is by sprinkling water on the surface. If it seeps in easily, then the wood is prepped and ready to take the stain. Use a natural-bristle brush to apply your stain evenly. Remember to patiently work your stain over the surface. Apply the stain smoothly in long strokes. For new wood, one coat of the stain would suffice. In case of old wood, if you wish to apply a second coat, allow a gap of around 4 hours after the first coat application. Never overdo the staining. Too many coats or too much of stain when applied, the end result might be a messy looking deck with wood that can breathe. It might also start peeling off. 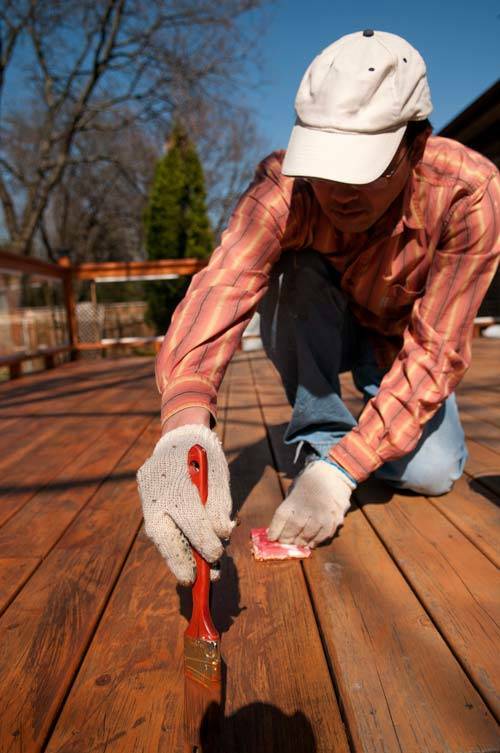 Once you are done with the staining the wood, start using your deck only after the wood is completely dry. Ideally allow a day or two for the wood to dry. Though the deck staining process might sound a little easier than the painting process, the key is to choose the right stain to apply it right. That is why you need an expert. They can help you choose the best deck stain Tyler, TX and stain your deck to ensure that you achieve the perfect looking deck that can also last longer. A little reminder: Once the staining is done, to maintain your deck, keep it clean and wash it once in a while. If any area on your deck is beginning to fade or starting to gray under the sun, use a wood brightener to touch it up. Looking for a quality and affordable paint contractor for your next project? Paint or wallpaper… Which is the better choice?